The word propolis, meaning “defenses before a town,” comes from the Greek. It is one of the bee’s building materials. The bees use this sticky substance in making and repairing their hives. The raw material is a resinous substance exuded by the leaf buds of trees such as the horse chestnut and poplar, and is found in cracks in the bark of trees such as spruce, larch, and other conifers. The bees collect it, take it back to the hive, and use it as a cement. In addition, whenever a foreign insect is in the hive, the bees encase it in propolis; because of its antibacterial qualities, the propolis disinfects the foreign object, thus protecting the hive and its occupants. According to Propolis, the Natural Antibiotic by Ray Hill [Ray Hill, Propolis, the Natural Antibiotic, Wellingborough, Northhamptonshire, England: Thorsons Publishers Limited, 1981. ], propolis is a sticky substance which protects leaf buds and prevents them from drying out. Its biologically active components may vary according to its plant source. A test of propolis collected in fifteen different districts of the USSR showed uniform constituents, the approximate breakdown of which was 50 to 55% resin and balsam, up to 30% wax, about 8 to 10% fragrant essential oils, and about 5% solid matter. It is said to be rich in fats, amino acids, organic acids, composite ethers of univalents alcohols, and trace elements such as iron, copper, tannic acid, phytocides, and antibiotics. The antibiotic properties of propolis are believed to come from the flavonoids it contains, particularly galangin. The name comes from galingale, an aromatic plant root from the East, which is related to ginger and has always been used medicinally. Plants containing flavonoids have been used as healing agents for centuries before these active substances were ever scientifically identified. According to Ray Hill, it was quite accidental that Dr. Lavie, while studying the natural biochemical defense of insects, learned that bees killed recently and put into a liquid medium without any preservative developed no bacteria. Dr. Lavie proved that the bees and their surroundings provided over seven antibiotics. Interestingly, Dr. Lavie found that extracts he made from the buds of poplar tree resin were identical in chemical consistency and potency to the propolis. Propolis can be valuable for anything involving bacteria or germs. It is said that any propolis treatment should work within three weeks or it is not going to work. The best way I have found to extract the properties from propolis is through an alcohol/water extraction. You can apply it with the alcohol, or you can slowly heat it, after straining, to evaporate the alcohol. Be careful never to get it too hot; many chemical constituents are heat sensitive. Because of its anti-bacterial properties, propolis has received rave reviews for blemishes. Bee propolis in a product helps keep the skin clean and free from germs. For serious blemishes or acne, it can be applied topically as well as taken internally. 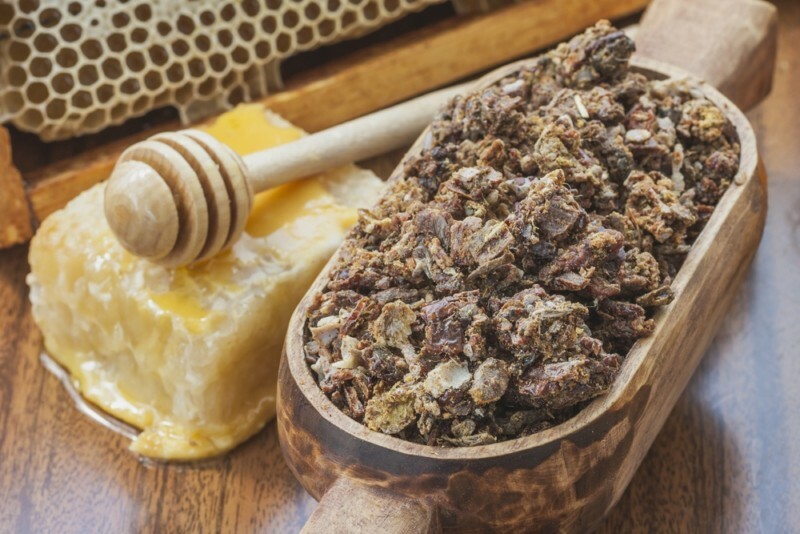 Propolis is often recommended for dry eczema with wonderful results; however, it has been known to aggravate wet eczema. It is also an age-old remedy for corns. Apply a propolis cream with a small gauze pad. In the first century A.D., Pliny mentioned the uses of bee propolis. His recommendations included to reduce swelling, to soothe pain, and to heal sores when they seemed hopeless to mend. In Russia during World War II, propolis was applied to wounds. Propolis ointment was often recommended for second-degree burns, and healing took place without scarring. Propolis has a stimulating effect and works with the skin’s natural regenerative process. I use bee propolis in many of my products; I find it most advantageous in astringents, creams, and products for blemishes. Caution: About 0.05% of the population is allergic to propolis.